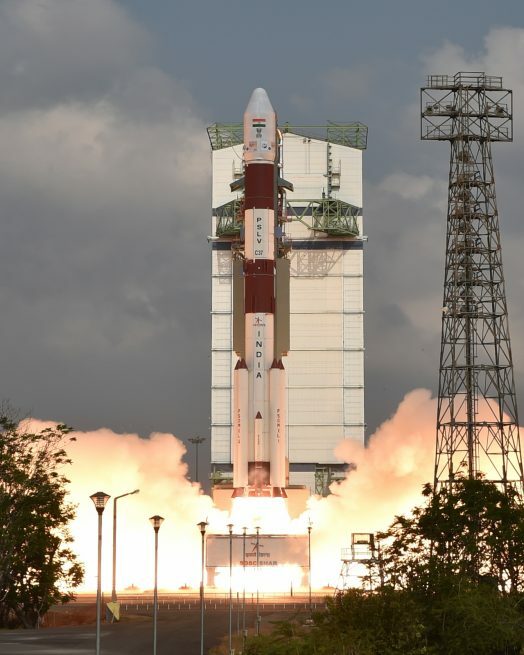 In its first launch of the year, India sent a record 104 satellites into space atop the country’s Polar Satellite Launch Vehicle (PSLV). The mission, PSLV-C37, lifted off at 9:28 a.m. local time Feb. 15 (10:58 p.m. EST Feb. 14 / 03:58 GMT Feb. 15) from the First Launch Pad of the Satish Dhawan Space Centre located on the coast of the Bay of Bengal. The previous record for the most satellites launched atop a single rocket went to the Russian-Ukrainian Dnepr which lofted 37 satellites into orbit in June 2014. 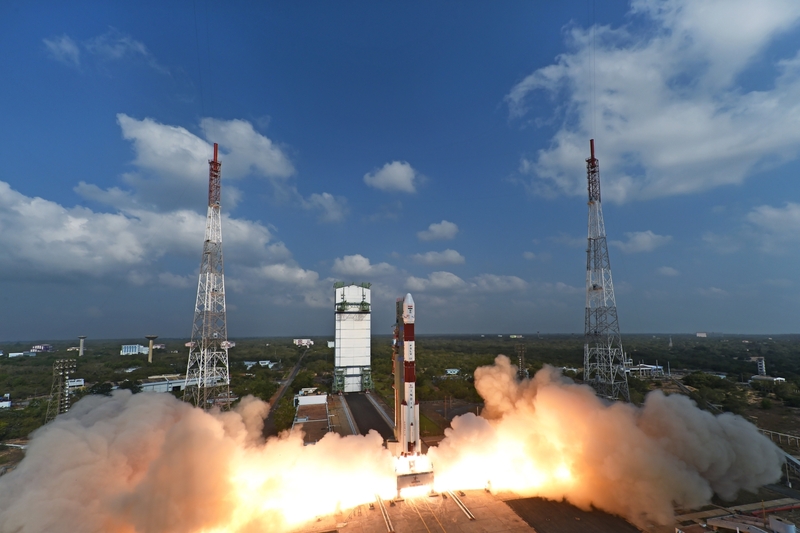 The previous record for a PSLV was 20 satellites in June 2016. The main passenger for the PSLV-C37 flight was the 1,574-pound (714-kilogram) CartoSat 2D satellite. It will be used for Earth observation. The remaining 103 “co-passenger” satellites weighed about 1,464 pounds (664 kilograms) combined. All of them were deposited into a 314-mile (505-kilometer) polar Sun-Synchronous Orbit. Of the 103 co-passengers, 101 were nanosatellites from countries such as Israel, Kazakhstan, the Netherlands, United Arab Emirates, and the United States. The other two nanosatellites were from India: INS-1A and INS-1B. 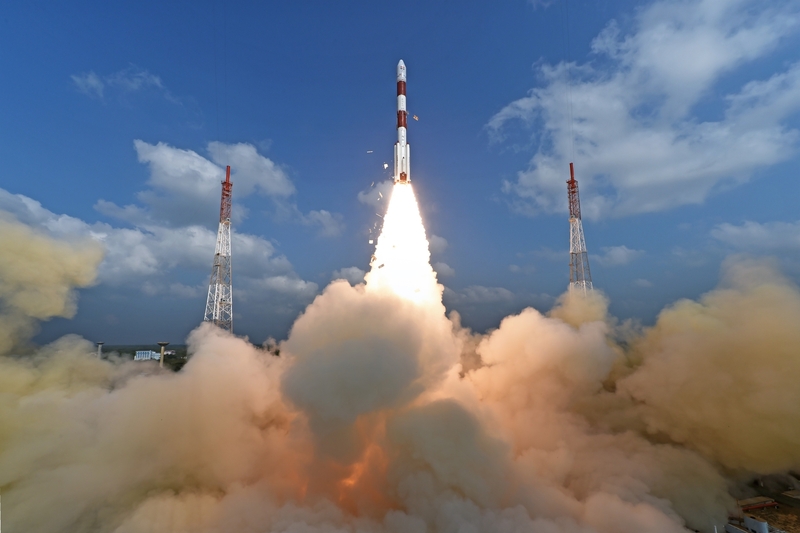 According to the Indian Space Research Organisation (ISRO), the 101 international satellites were launched as part of a commercial arrangement between the customer and Antrix Corporation Limited, which is a company run by the Indian government under the Department of Space, a commercial arm of ISRO. Eighty-eight of the nanosatellites were built by San Francisco-based Planet Labs. This launch doubled the number of satellites the company has launched since its 2010 founding. However, while most of the small satellites are deployed from the International Space Station, which has an orbit that does not have 100 percent ground coverage (it has an orbital inclination of 51.6 degrees), these are in a polar orbit, which covers the entire planet over time. 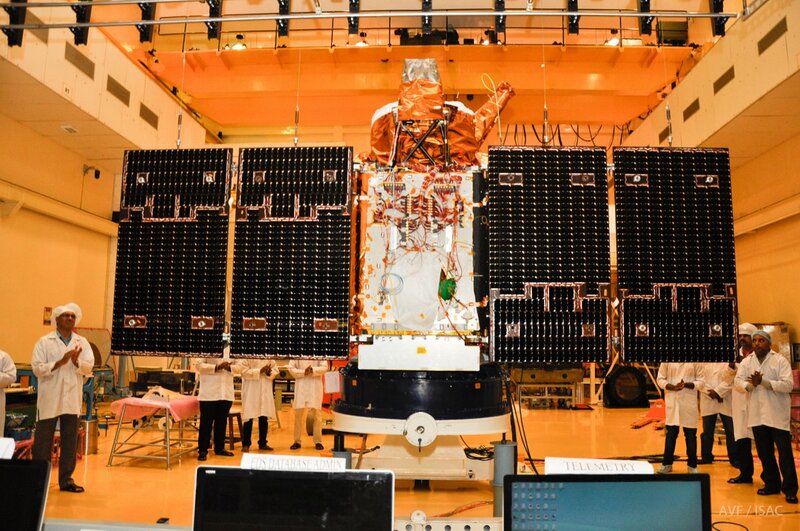 The PSLV used in the launch was in the XL configuration, which uses solid strap-on motors. In total, the four-stage rocket is about 144 feet (44 meters) tall. At liftoff, the 66-foot (20-meter) long, 9.2-foot (2.8-meter) wide first stage, as well as four of the six strap-on boosters, ignited its hydroxyl-terminated polybutadiene solid propellant and began climbing to clear the launch tower. Moments later, it started to pitch over and roll in order to place it on its southeasterly trajectory over the Indian Ocean. Twenty-five seconds later, the remaining two boosters ignited to propel the rocket even faster. About 1 minute, 10 seconds after liftoff, two of the four ground-lit boosters, having consumed their fuel, detached. Two-tenths of a second later, the other two ground-lit boosters fell away as planned. Some 22 seconds later, the final two strap-on boosters finished their burn and also fell away leaving the first stage by itself to finish its burn and separate, which occurred at 1 minute, 51 seconds after leaving the Satish Dhawan Space Centre. Fractions of a second later, while the stack was 42 miles (67 kilometers) in altitude traveling some 1.4 miles per second (2.2 kilometers per second), the second stage’s liquid fueled Vikas engine ignited. It consumed dinitrogen tetroxide and unsymmetrical dimethylhydrazine for about 158 seconds before cutting off and separating just over four minutes after liftoff. In the meantime, having left the densest part of the atmosphere, the payload fairing protecting the flights 104 satellite occupants jettisoned just over 2.5 minutes into the flight. Two seconds after the second stage separated, the third stage took over. It too was a solid propelled stage consuming the same type of fuel as the first stage and its strap-on boosters. At the end of the third stages 83-second burn, it separated from the fourth stage around 8 minutes, 22 seconds after leaving the launch pad. Ten seconds later, the fourth stages two L-2-5 engines ignited to finish the job of placing the satellites in the desired orbit. The fourth stage cut off as planned at 16 minutes, 48 seconds, having achieved orbital velocity. The first spacecraft to be separated was the CartoSat 2D satellite at 17 minutes, 30 seconds. That was followed about 10 seconds later by INS-1A and INS-1B. The remaining 101 satellites were separated in pairs at 10-second increments starting at 18 minutes, 33 seconds. Verification that all of the nanosatellites were are operating as designed will likely take days or weeks as they slowly drift apart and each is individually identified. The launch of this PSLV rocket marked the seventh successful orbital launch of 2017. ISRO’s next launch is expected sometime in March. It will utilize a Geosynchronous Satellite Launch Vehicle Mk. 2 to send the GSAT 9 satellite into a geostationary transfer orbit. Rocket Science is turning into reliable science. All the best for future Venus and Mars as well as Moon Mission to ISRO. Keeping going ISRO, and it should now focus on manned missions to Moon, and other planets . In perspective of launching rockets , give some rest to PSLV and go for GSLV mark- II/III rockets for higher payload capability. Manned missions are the need of time and nation now.